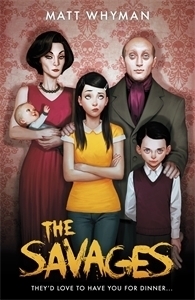 Sasha Savage lives in a family who all follow a strange tradition. They look like a normal family; Her shopaholic mother Angelica, rather strict father Titus, baby Katya, and rather nasty brother Ivan. But inside their house, away from prying eyes, they’re modern day cannibals! They don’t eat it all of the time, but human flesh is their favourite meat. When Sasha gets a new boyfriend though, the family discover that he is handsome, charming, and… a vegetarian. Sasha decides to try a month skipping meat from her diet, which, obviously, is a huge thing to keep a secret in a house of cannibals. Whilst Sasha is swapping meat for tofu, a curious detective is getting his nose stuck where it shouldn’t be. Will he discover the secret cannibalism of the Savage family, and what lengths will he go to in order to find the truth? This. Book. Was. AWESOME. I loved it so much, and read it in quite a short space of time. It was one of the books that really stood out to me at the Hot Key bloggers lunch the other week. It was really funny, most of the humor quite dark. An unmissable, unique family drama, with great and unpredictable plot twists. I loved how it was a normal drama, with teenage love, and rebellion, but with the twist of a cannibal family which really livens the story up. I loved all of the characters, especially the Savages- the typical yet different family. I think my favourite character, after teenage Sasha, was Ivan. He really was a nasty piece of work- sticking thumb tacks in school lunches and lacing Sasha’s (vegetarian) boyfriend’s tea with chicken stock cubes (Hahahaha)- he reminded me a little of the girl, Wednesday, from the Addams Family! The detective was funny, too, because of his obsession with fast food and how it always seemed to get in the way of his investigations. Overall, I really, really love The savages. It was hilarious and scary all at the same time, and a really great read from an author I’d love to hear more from. An essential read for young teens and upwards! This entry was posted in Uncategorized and tagged comedy, dark humor, romance on February 21, 2013 by keithbwalters.